Results. The estimated labor savings comparing the preimplementation and postimplementation time studies for automated dispensing cabinet (ADC) refills, first-dose requests, supplemental cart fill, and medication procurement totaled 2.6 full-time equivalents (FTEs). After departmental reorganization, a net reduction of 2.0 technician FTEs was achieved. The average turnaround time for stat medication requests using CDT was 7.19 minutes, and the percentage of doses filled in less than 20 minutes was 95.1%. After implementing CDT, the average accuracy rate for all dispense requests increased from 99.02% to 99.48%. The inventory carrying cost was reduced by $25,059. The article comes from Jack Temple and Brad Ludwig in the department of pharmacy at the University of Wisconsin Hospital and Clinics, Madison (UWHC). According to the article UWHC is a 471-bed tertiary facility with all the normal medical services you’d expect to see in a medium to large facility. They are similar in size to my facility at 581-beds. 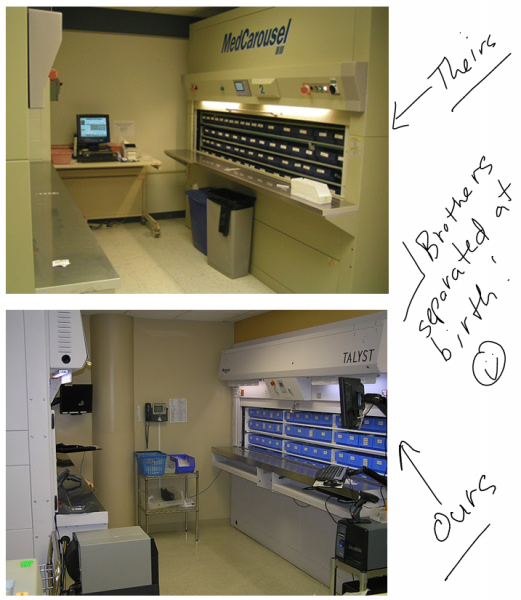 Unlike my facility however, they use a hybrid distribution model consisting of a centralized robotic cart fill as well as automated dispensing cabinets (ADCs). We, on the other hand, do not use a cart fill model and chose to dispense greater than 95% of our medications directly from ADCs. I am not a fan of the cart fill model as it is cumbersome, wasteful and time consuming. In addition the medications stored in patient carts can potentially be hours behind changes to the patients medication regimen resulting in missing medications and extra medications lying around, i.e potential medication errors. For the article UWHC evaluated turnaround time for stat medications, technician accuracy, the medication procurement process, labor requirements and inventory management before and after implementation of the carousel dispensing technology (CDT). I can relate to much of the information in the article as our experiences with CDT were similar. There is a lot of good information in the article for any facility thinking about implementing CDT so make sure you check it out. The images below represent the carousels from UWHS from the article (top) and our carousel set-up (bottom) Scary similarity. Jerry is that a chum bucket there on that cart?